Derbyshire Cricket Board (DCB) are delighted to announce that Chevin Homes will sponsor the Boys County Age Group (CAG) programme for the next two seasons. They will become the headline shirt sponsor of all of the Boys CAG squads from U10s through to U17s. This is the second year Chevin Homes have provided sponsorship for a DCB programme. In 2017 they sponsored the DCB Holiday programme which saw over 500 children attend fun courses over the summer, all receiving a Chevin Homes T-Shirt. The sponsorship will allow the DCB to improve and develop the CAG programme which will ultimately provide better development opportunities to the players. There are currently over 100 talented players in the DCB CAG programme playing across 8 squads. All 8 squads currently receive coaching over the winter and a match play programme in the summer. Head of DCB, Richard Wood said: "We are extremely grateful for the generous support of John Fearnehough, James Cokayne and Chevin Homes. 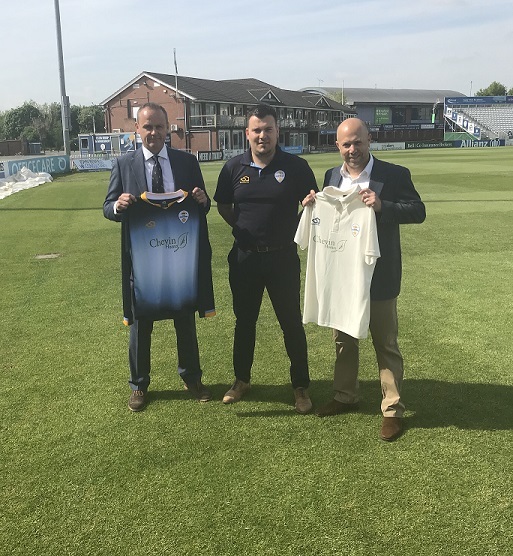 James and John are both passionate about the development of cricket in Derbyshire and they clearly want to help support the development of talented young cricketers in their journey through the County Age Group programme. One of our strategic aims is to provide a player pathway that gives players the opportunity to be the best they can be. I am confident that with the support of Chevin Homes we can move a long way towards achieving this over the next two years."